After 11 years of patience and perseverance in the lab, Dr. Hadiyah-Nicole Green’s groundbreaking laser technology cancer treatment, which induces 100 percent tumor regression in mice, is having its day in the sun. She was recently awarded a $1 million grant from the Veterans Affairs’ Office of Research & Development to take her findings to clinical trials. The young assistant professor at Atlanta’s Morehouse School of Medicine Department of Physiology is not your typical lab rat. She’s graceful and elegant in one moment, bubbly and playful the next, then she’s back in the lab, forging through the complexities of one of the most challenging diseases of our time. 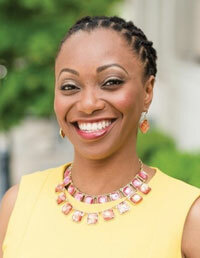 We are honored to welcome to-day’s FACE of the South, Dr. Hadiyah-Nicole Green. When did you know that science was going to be your career? Was there an “aha” moment that clarified this as a life passion for you? My freshman year at Alabama A&M University, I had changed my major three times. I was coming out of calculus, and a lady named Ayesha Fields, who was working on her Ph.D. in physics at the time, pulled me aside and basically said, “You must be pretty smart taking calculus as a freshman. I bet you can do physics.” She told me that if I majored in physics, then I could probably go into any other major later, so I thought it was the perfect major for someone who was undecided. And like that, I became a physics major. She went on to become the 50th African American female in the United States to get a Ph.D. in physics, and then I became the 76th. After graduation, I went back home to St. Louis [MO], and my aunt, who raised me with my uncle, announced that she had cancer and that she would rather die on her own terms than experience the side effects of chemotherapy and radiation. I was her caregiver. Seeing cancer eat her from the inside out changed me. Three months after she passed, my uncle was diagnosed with esophageal cancer, and I was his caregiver while he went through chemo and radiation. Seeing him lose 150 pounds and all of his hair, that is when I really became filled with the conviction that there has to be a better way. When did you get the idea for your laser treatment? During a freshman intern-ship at NASA, one of the scientists explained that satellites from outer space can tell whether a dime is face-up or face-down. And I said, “If a satellite can tell whether a dime is face-up or face-down, then why can’t we treat cancer in a specific region of the body?” That didn’t make sense to me as a physicist. So after my aunt died, I sketched out what I thought would be a good idea for using lasers to treat cancer. Then I went to grad school at the University of Alabama at Birmingham to figure out how to use lasers to treat cancer. That was my sole objective. It was singular and focused, and that was all I wanted to do in life. That is when I knew that this was my passion, my purpose, my ministry — this was it. “If I never got tenure, if I never got promoted, but I pushed my cancer treatment to the point where it actually was available and helped save human lives, I would feel like I had done my duty on this planet,” says Dr. Green. Describe in layman’s terms the groundbreaking technology you’ve developed to target cancer cells. So if chemotherapy and radiation is like dropping an atom bomb on the country, then laser treatment is like zoning in on a specific house. It uses laser-activated nanoparticles, which are tiny particles in a solution that heat up when they are excited by the laser. So anything other than the targeted nanoparticle won’t be affected by the laser. And it works in mice! One of the technologies is an intratumoral therapy that, after a single 10-minute treatment over the course of 10 to 15 days, results in a 100 per-cent reduction in the tumor volume. It is currently working better than most treatments available at the hospital. Describe the most exciting moment you’ve ever experienced in a lab. What does it take to be a successful scientist? I have faced challenges with racism. That was harder to go through than the academic part and the actual experiments. That was the part that ate away at me the most. I’d go home and cry and say, “I wish I didn’t have to deal with this.” And my family would say, “When you finish quitting tonight, get back up in the morning and go back at it and stay focused.” It was not easy, but I didn’t think about, after the fact, how many people would be inspired because I just didn’t quit. As a result of all of this media exposure, little girls wrote black history month reports about me, portrayed me in their programs and said they want to be scientists like Dr. Green when they grow up. That has been the most rewarding part about all of this. 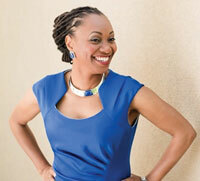 Why is it important to you to mentor and set a positive example for young women and particularly Black women? When it relates to Black women, I think that the images that we see portrayed on TV and in the media have historically not been the most positive. I think it’s important for little girls to see positive role models that look like them. And I wouldn’t be here if I didn’t have people who mentored me. That really mattered. I know some people who weren’t encouraged, and when you don’t water a flower, it dies. Shifting gears, how do you like to spend your free time? I love traveling. I have climbed the Great Wall of China, been to Kyoto and seen a ceremony of the geishas, visited the gardens in Singapore, seen the ruins in Greece and the Louvre in Paris. A lot of those experiences were afforded to me because of the science conferences. And I love live music, and I love, love, love to dance! If you could go back 10 years, what advice would you give yourself? Don’t worry! Don’t stress! It’s going to be just fine! I think people assume that I’m like Sheldon, and I’m like, no, I’m the hotter, cooler version! And people are usually surprised that I was Miss A&M. I’m gluten-free 99 percent of the time, but my guilty pleasure is a chocolate brownie. And I sleep with my phone ringers off. I like to just zone out and shut everybody out and rest. What is your best piece of advice? Don’t let someone else’s limitations define your reality, and don’t let them tell you what’s not possible. It may not be possible for them, but it may be very possible and realistic for you. With the exception of faith, family and friends, what are three things that you cannot live without: Comfortable shoes and clothes; good, healthy food; and good hugs from good people. Visit Dr. Green’s website at: physics2cancer.org.